HDR photography. Ahhh! You either love it… or you’re wrong! The beauty of HDR is that its beautiful. 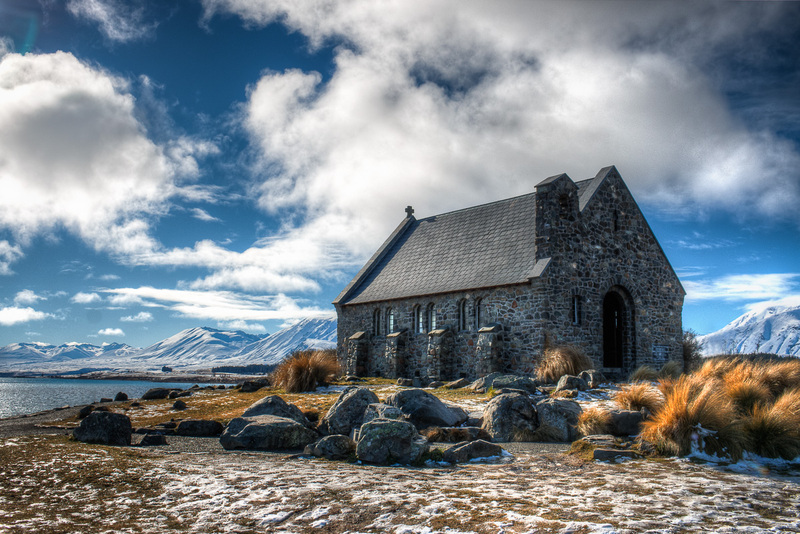 High Dynamic Range photos have vibrant colors and tactile textures that make you want to sing! One of the main inconveniences preventing more photographers getting going with HDR photography is that you need to take all your photos using a tripod. That’s right isn’t it – otherwise it just doesn’t work. But… a tripod is heavy, awkward, irritating, it slows you down, its embarrassing and that’s the end of that. But, you see, that’s not entirely true. On a recent trip to New Zealand I cleverly left my tripod in my car back in the Sydney airport carpark. Disaster? Not quite. 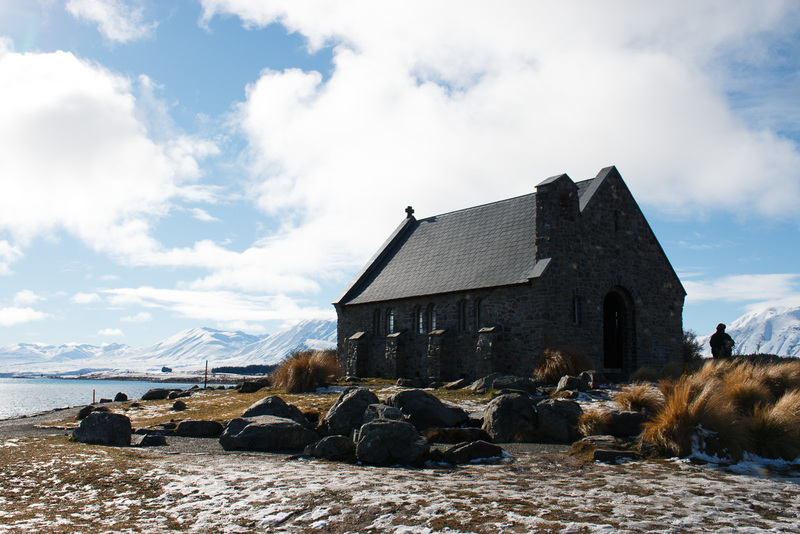 Check out these before and after photos of this church at Lake Tekapo, taken hand-held. 1. Setup your camera for HDR by selecting a bracket of 3 shots at -2EV, 0EV, +2EV. This is fine for most lighting situations and when hand-holding its best to minimize the amount of shots in the bracket. Always use Aperture Priority mode for HDR as this ensures all the shots have the same depth of field. And, finally, set the camera’s drive mode to Continuous Shooting – this causes the three shots to be fired off in rapid succession with only a single press of the shutter release. 2. Set your camera to a 2 second shutter delay. This gives you a crucial 2 second gap between pressing the button and the shots being taken, enabling you to re-stabilize yourself and the camera. If you’re lucky and you have a camera with a Custom exposure mode setting, you can save all these settings and then easily access this entire HDR configuration by simply selecting the Custom mode. You should also save a preferred aperture and ISO – I’d recommend f8 and ISO100 as a good starting point for HDR. For more detail on Custom mode see this previous post. 3. Use a wide angle lens. The wider the lens the less any movements you make between (or during) exposures will be noticeable. These days the HDR software is excellent at compensating for any minor movements you do make between shots (like breathing!). 4a. Notice the shutter speed that your camera has metered for the first (normal 0EV) exposure. Then multiply this by 4. That will give you the shutter speed that it will use for the longest (+2EV over-exposed) shot. This needs to be a shutter speed that you’d be comfortable hand-holding for any normal shot. For example if the metered speed is 1/125th, then the longest exposure in the bracket will be 1/125 x 4 which is 1/30th second, which is fine if you’re using a wide angle lens. Of course anything faster is even better. 4b. If you need faster shutter speeds either increase your aperture (using lower f numbers) or if the aperture is fully open, increase your ISO. Increasing ISO will introduce more noise into the photos but modern cameras and software are getting much better at minimizing the impact of this so don’t worry about it too much. And that’s it! With a wide angle lens, a 2 second shutter delay and a reasonably fast shutter speed, those three shots will be sharp enough and aligned enough for the software to easily iron out any discrepancies. If you want to keep up with all the latest trends in photography gear and techniques the only place you need to go is This Week In Photo. Its a regular weekly podcast hosted by the ultra-smooth Frederick Van Johnson. And if you want to learn photography techniques, and how to use lightroom and photoshop there’s only one place to go for that too. The recently renamed and merged KelbyOne now combines all the online training videos from Kelby Training with all the resources of the National Association of Photoshop Professionals (NAPP). Its money very well spent! Finally, if you haven’t already subscribed, Adobe have an amazing proposition for photographers. Get both Adobe Lightroom and Photoshop (essential post processing tools for HDR photographers) for just $9.99/month on their Creative Cloud Photography Plan. This is one of those rare times when its really easy to reach for your wallet! When you visit a major tourist attraction along with hundreds of other tourists, how do you come away with photographs that are a little bit different? The answer is simple: Use your feet! 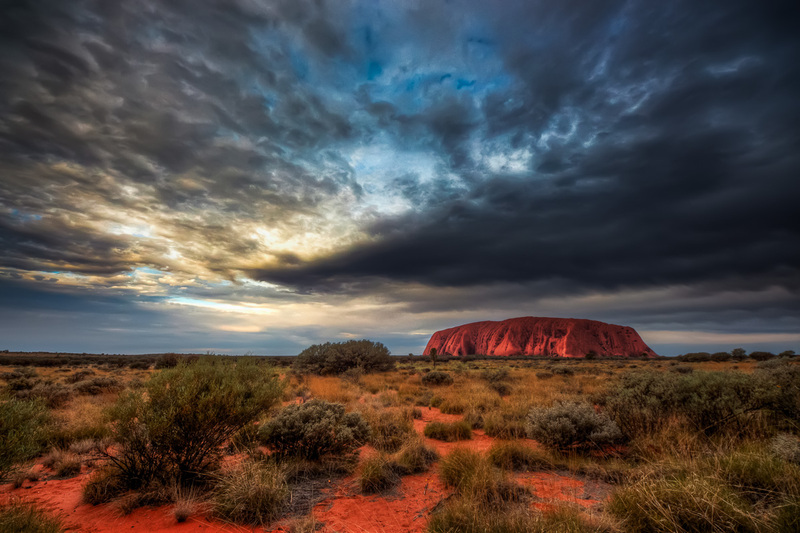 At Uluru (aka Ayers Rock) deep in the red desert in the very center of Australia everyone heads out for sunset. 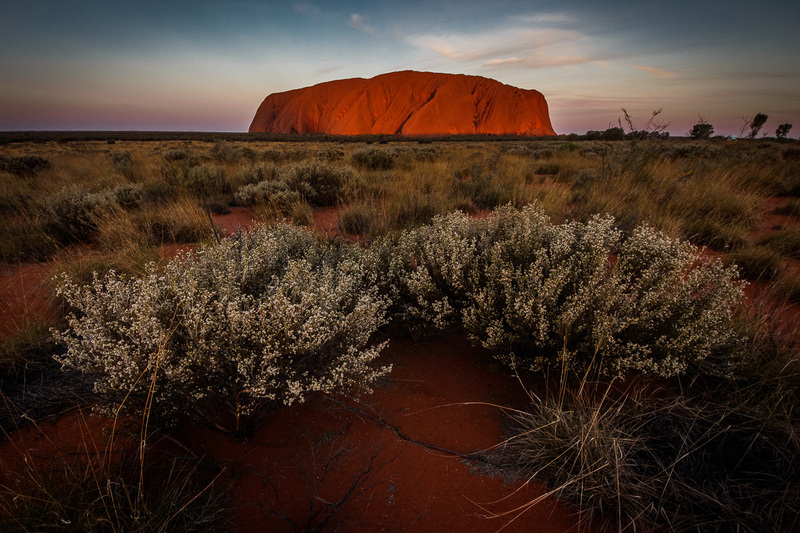 Over a period of about half an hour as the setting sun lights up the rock from directly behind your back, the colors of Uluru slowly change from pink to orange to red to purple. Its a beautiful sight and well worth the gigabytes of space it uses up on the thousands of tourist cameras which record every moment. But… all those tourists are carefully corralled into a long narrow viewing area. They park their cars and stand by a fence and watch while their shadows stretch out in front of them. And they point their cameras in the right direction and snap away. The result is that everyone gets a good photo but everyone gets more or less exactly the same photo. This scene is repeated at countless view points, at sunrises and at sunsets throughout the world. So for something a bit different, try this. Walk out of the corral and up the road a bit. Take a couple of steps into the bush and find a different and more unique view. Look for something different to include in the frame as foreground interest. Try climbing something or getting low to the ground for a change of perspective. So don’t be a sheep and your photos will (usually) be better for it. For those who live part of their lives in the lands of Middle Earth, this is a big day. The worldwide release of the second part of Peter Jackson’s movie of JRR Tolkien’s book The Hobbit is about to begin, and the world is suddenly a better place. For reasons best known to the High Elves the movie can be seen first by the dwarves in the low countries of Europe – Belgium for example! And for darker reasons, known only to the residents of Mirkwood, the orcs and goblins of South America must wait another couple of weeks.